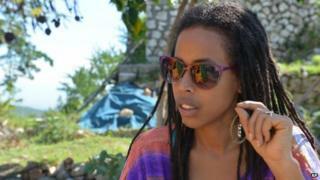 Image caption Donisha Prendergast says the supporters will "camp out and reason"
Bob Marley's granddaughter has become involved in a campaign to protect the site of Jamaica's first Rastafarian community, it appears. Donisha Prendergast and other supporters are occupying a tabernacle - a Rastafarian place of worship - near the village established by Leonard P Howell in the 1930s, according to the Jamaica Gleaner. The campaign wants the property - a hilltop called The Pinnacle west of the capital, Kingston - to belong to the Howell family and the community. Prendergast told the newspaper: "We are not going anywhere, one by one we are filing in, we are going to camp out and reason." It appears that the Rastafarian community may have no title to the land, but they claim they are entitled to use it due to their historical and cultural connection to the site. A quarter-acre plot on The Pinnacle has been declared a national monument, the Jamaica Observer says. But the campaign is calling for the whole area to be preserved. The dispute over ownership on The Pinnacle has been the subject of long-running controversy, with Howell's descendants fighting court cases against local developers. Howell's son, Monty, says papers proving the family's ownership of the land were destroyed during the 1930s and 1940s because the island's then-colonial authorities thought it "presumptuous" for Howell to own it. "No black person in Jamaica owned property, nothing compared to Pinnacle," he told the Jamaica Observer. "They tried everything to chase my father off that land." The case is heading back to the courts in Jamaica this week.